This is the current revision of this page, as edited by ClueBot NG (talk | contribs) at 17:06, 11 January 2019 (Reverting possible vandalism by Elijah9116 to version by DannyS712. Report False Positive? Thanks, ClueBot NG. (3575386) (Bot)). The present address (URL) is a permanent link to this version. Alan Jackson collaborated with Jimmy Buffett on the song "It's Five O'Clock Somewhere", which spent eight weeks at number one. Hot Country Songs is a chart that ranks the top-performing country music songs in the United States, published by Billboard magazine. In 2003, nineteen different songs topped the chart, then published under the title Hot Country Singles & Tracks, in 52 issues of the magazine, based on weekly airplay data from country music radio stations compiled by Nielsen Broadcast Data Systems. Singer George Strait's song "She'll Leave You with a Smile" was at number one at the start of the year, having been at the top since the issue dated December 28, 2002. It remained at number one for one further week in 2003 before being replaced by "19 Somethin'" by Mark Wills. The highest total number of weeks spent at number one by a song in 2003 was the eight achieved by "It's Five O'Clock Somewhere", a collaboration between Alan Jackson and Jimmy Buffett. The duet spent an initial seven weeks at the top, was replaced for a week, and then returned for a final week at number one. The song's first spell at number one tied for the longest unbroken run at the top with "Have You Forgotten?" by Darryl Worley. 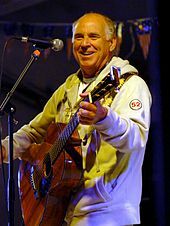 The success of "It's Five O'Clock Somewhere" gave Jimmy Buffett his first ever country number one, more than thirty years after he began his singing career. Another collaboration between a younger star and a music veteran to top the charts in 2003 was "Beer for My Horses" by Toby Keith and Willie Nelson, which spent six weeks at number one and made Nelson, at age 70, the oldest singer to top the chart. The number one position was dominated by male artists; no solo female singers topped the chart in 2003, although the all-female band Dixie Chicks spent a single week at number one. Three singers achieved their first number one hits in 2003, Gary Allan with "Man to Man", Joe Nichols with "Brokenheartsville", and Dierks Bentley with "What Was I Thinkin'". "Brokenheartsville"'s rise to the top benefited from a backlash against previous chart-toppers Dixie Chicks, after the group's lead singer Natalie Maines made controversial comments about then-United States President George W. Bush. This led to a number of radio stations dropping their song "Travelin' Soldier" and thus impacting its chart performance. Allan followed up "Man to Man" with a second number one later in the year with "Tough Little Boys" and was one of only two artists to place multiple songs at the top of the chart in 2003, the other being Toby Keith, whose six weeks at number one with "Beer for My Horses" and five with "I Love This Bar" gave him a total of eleven weeks at number one, the most by any act in 2003. The final number one of the year was "There Goes My Life" by Kenny Chesney. When Willie Nelson reached number one with his collaboration with Toby Keith, "Beer for My Horses", he became the oldest artist to top the chart, at age 70. "It's Five O'Clock Somewhere" was Jimmy Buffett's first appearance at number one in a career which had spanned more than thirty years. Dierks Bentley achieved his first number one with "What Was I Thinkin'". "Who Wouldn't Wanna Be Me"
^ McKinley, Jr., James C. (October 26, 2012). "Changes to Charts by Billboard Draw Fire". The New York Times. Retrieved May 24, 2013. ^ "Hot Country Songs chart for December 28, 2002". Billboard. Archived from the original on June 2, 2016. Retrieved September 2, 2010. ^ Scaggs, Austin (September 18, 2003). "Q & A: Jimmy Buffett". Rolling Stone. Retrieved October 4, 2017. ^ Dauphin, Chuck (April 30, 2013). "Willie Nelson's 10 Biggest Billboard Hits". Billboard. Retrieved October 5, 2017. ^ Wolley, John (June 16, 2003). "Toby Keith More Than OK in Oklahoma". CMT. Retrieved November 10, 2017. ^ "Wilson ends female drought atop country chart". Billboard. May 29, 2004. p. 72. Retrieved October 6, 2017. ^ Loftus, Johnny. "Gary Allan : Biography & History". AllMusic. Retrieved October 5, 2017. ^ Huey, Steve. "Joe Nichols : Biography & History". AllMusic. Retrieved October 5, 2017. ^ Gilbert, Calvin (September 19, 2003). "Dierks Bentley Lands First No. 1". CMT. Retrieved October 5, 2017. ^ Mansfield, Brian (March 18, 2003). "Dixie Chicks' chart wings get clipped". USA Today. Retrieved October 6, 2017. ^ "Dixie Chicks pulled from air after bashing Bush". CNN. Reuters. March 13, 2003. Retrieved October 6, 2017. ^ "Hot Country Songs chart for January 4, 2003". Billboard. Retrieved September 2, 2010. ^ "Hot Country Songs chart for January 11, 2003". Billboard. Retrieved September 2, 2010. ^ "Hot Country Songs chart for January 18, 2003". Billboard. Retrieved September 2, 2010. ^ "Hot Country Songs chart for January 25, 2003". Billboard. Retrieved September 2, 2010. ^ "Hot Country Songs chart for February 1, 2003". Billboard. Retrieved September 2, 2010. ^ "Hot Country Songs chart for February 8, 2003". Billboard. Retrieved September 2, 2010. ^ "Hot Country Songs chart for February 15, 2003". Billboard. Retrieved September 2, 2010. ^ "Hot Country Songs chart for February 22, 2003". Billboard. Retrieved September 2, 2010. ^ "Hot Country Songs chart for March 1, 2003". Billboard. Retrieved September 2, 2010. ^ "Hot Country Songs chart for March 8, 2003". Billboard. Retrieved September 2, 2010. ^ "Hot Country Songs chart for March 15, 2003". Billboard. Retrieved September 2, 2010. ^ "Hot Country Songs chart for March 22, 2003". Billboard. Retrieved September 2, 2010. ^ "Hot Country Songs chart for March 29, 2003". Billboard. Retrieved September 2, 2010. ^ "Hot Country Songs chart for April 5, 2003". Billboard. Retrieved September 2, 2010. ^ "Hot Country Songs chart for April 12, 2003". Billboard. Retrieved September 2, 2010. ^ "Hot Country Songs chart for April 19, 2003". Billboard. Retrieved September 2, 2010. ^ "Hot Country Songs chart for April 26, 2003". Billboard. Retrieved September 2, 2010. ^ "Hot Country Songs chart for May 3, 2003". Billboard. Retrieved September 2, 2010. ^ "Hot Country Songs chart for May 10, 2003". Billboard. Retrieved September 2, 2010. ^ "Hot Country Songs chart for May 17, 2003". Billboard. Retrieved September 2, 2010. ^ "Hot Country Songs chart for May 24, 2003". Billboard. Retrieved September 2, 2010. ^ "Hot Country Songs chart for May 31, 2003". Billboard. Retrieved September 2, 2010. ^ "Hot Country Songs chart for June 7, 2003". Billboard. Retrieved September 2, 2010. ^ "Hot Country Songs chart for June 14, 2003". Billboard. Retrieved September 2, 2010. ^ "Hot Country Songs chart for June 21, 2003". Billboard. Retrieved September 2, 2010. ^ "Hot Country Songs chart for June 28, 2003". Billboard. Retrieved September 2, 2010. ^ "Hot Country Songs chart for July 5, 2003". Billboard. Retrieved September 2, 2010. ^ "Hot Country Songs chart for July 12, 2003". Billboard. Retrieved September 2, 2010. ^ "Hot Country Songs chart for July 19, 2003". Billboard. Retrieved September 2, 2010. ^ "Hot Country Songs chart for July 26, 2003". Billboard. Retrieved September 2, 2010. ^ "Hot Country Songs chart for August 2, 2003". Billboard. Retrieved September 2, 2010. ^ "Hot Country Songs chart for August 9, 2003". Billboard. Retrieved September 2, 2010. ^ "Hot Country Songs chart for August 16, 2003". Billboard. Retrieved September 2, 2010. ^ "Hot Country Songs chart for August 23, 2003". Billboard. Retrieved September 2, 2010. ^ "Hot Country Songs chart for August 30, 2003". Billboard. Retrieved September 2, 2010. ^ "Hot Country Songs chart for September 6, 2003". Billboard. Retrieved September 2, 2010. ^ "Hot Country Songs chart for September 13, 2003". Billboard. Retrieved September 2, 2010. ^ "Hot Country Songs chart for September 20, 2003". Billboard. Retrieved September 2, 2010. ^ "Hot Country Songs chart for September 27, 2003". Billboard. Retrieved September 2, 2010. ^ "Hot Country Songs chart for October 4, 2003". Billboard. Retrieved September 2, 2010. ^ "Hot Country Songs chart for October 11, 2003". Billboard. Retrieved September 2, 2010. ^ "Hot Country Songs chart for October 18, 2003". Billboard. Retrieved September 2, 2010. ^ "Hot Country Songs chart for October 25, 2003". Billboard. Retrieved September 2, 2010. ^ "Hot Country Songs chart for November 1, 2003". Billboard. Retrieved September 2, 2010. ^ "Hot Country Songs chart for November 8, 2003". Billboard. Retrieved September 2, 2010. ^ "Hot Country Songs chart for November 15, 2003". Billboard. Retrieved September 2, 2010. ^ "Hot Country Songs chart for November 22, 2003". Billboard. Retrieved September 2, 2010. ^ "Hot Country Songs chart for November 29, 2003". Billboard. Retrieved September 2, 2010. ^ "Hot Country Songs chart for December 6, 2003". Billboard. Retrieved September 2, 2010. ^ "Hot Country Songs chart for December 13, 2003". Billboard. Retrieved September 2, 2010. ^ "Hot Country Songs chart for December 20, 2003". Billboard. Retrieved September 2, 2010. ^ "Hot Country Songs chart for December 27, 2003". Billboard. Retrieved September 2, 2010. This page was last edited on 11 January 2019, at 17:06 (UTC).